In which context are you working as an art educator? Wiebke Trunk: I work within the confines of a university and as a freelancer. The starting point is my perspective as an artist. WT: With colleagues, employees of cultural institutions, e.g. Institute for Foreign Relations, the Goethe Institute, municipal museums, schools etc. What is your understanding of art education? WT: For me this is both an opportunity and a possibility to “use” art. Or to be more precise: to encourage and incite people to combine perception and resistance. I think this manner of dealing with art education is a fundamentally political task. What is the relationship (for you) between education and art? WT: See the previous answer. Why educate people about (contemporary) art? In what kind of relationship do you see the practice of curating and educating? WT: A reform is long-overdue here. Seen against the background of establishing this distance, the hierarchical practice, that is nonetheless still taking place (especially at events like the documenta, the Venice Biennale etc. ), is for me absurd and paradoxical. Why is art education important for a museum or an institution? WT: Because this is the only way that the crucial invitation can reach to a wide audience. Where do we find the (institutional) spaces, in which we can have a discussion about our experiences of art? 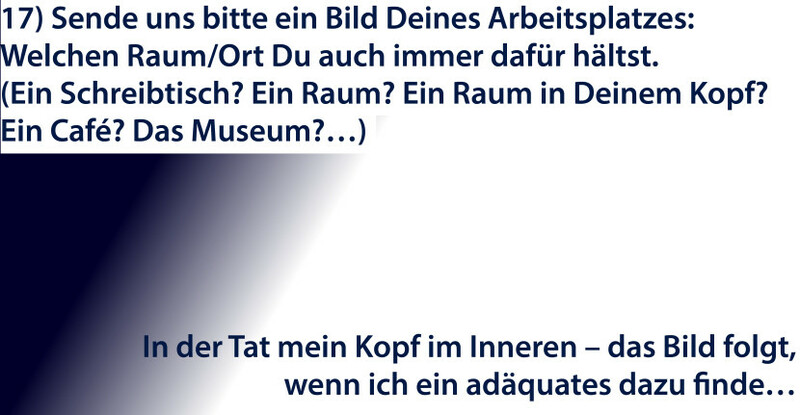 WT: In some university spaces, in a few (German-speaking) museums, in private spaces, hopefully in several ateliers – unfortunately rarely in academic circles. To what extent can art education and art mediation open up a new sphere of action? WT: It can break open the still strongly regulated hegemonies and create approaches to which the audience, therefore all those who have the opportunity to visit an exhibition, has a basic right. This type of education is the basis of political education through the critical examination of cultural products and artifacts – this includes works of art (as a part of specified instruments for differentiation encoded in Western cultural practices). When do you think art education is successful? When do you think art education is complicated? WT: When the mediators are no longer needed and the pleasure in examining, discussing, thinking and (hopefully even once in a while) touching the works of art becomes more and more natural. Is there a specific method or strategy you currently work with? WT: I try to win the confidence and trust of my discussion partners and fight for free admission to exhibitions. Which books and projects are important for your work and why? _Brenner, Hildegard: Die Kunstpolitik des Nationalsozialismus.Hamburg 1963. _Haug, Wolfgang F.: Die Faschisierung des bürgerlichen Subjekts. Hamburg,Berlin 1987. _Schmitz-Berning, Cornelia: Vokabular des Nationalsozialismus. Berlin, New York 2000. _Wenk, Silke: Aufgerichtete weibliche Körper. Zur allegorischen Skulptur im deutschen Faschismus. In: Inszenierung der Macht. Ästhetische Faszination im Faschismus. Ausstellungskatalog. Berlin 1987. Which questions would you like to ask an art educator? How do you imagine the future of art education? WT: Responsible, courageous and open. Image 1: Response to question 17): Wiebke Trunk. Visualization: Gila Kolb, 2015. Image 2: Wiebke Trunk, photo: Nanna Lüth.